The NOW Labz project is a collaboration between the HotSpring Network, Quipu.cc, and partners, aimed at bringing thoughtful people together to brainstorm solutions to big problems. 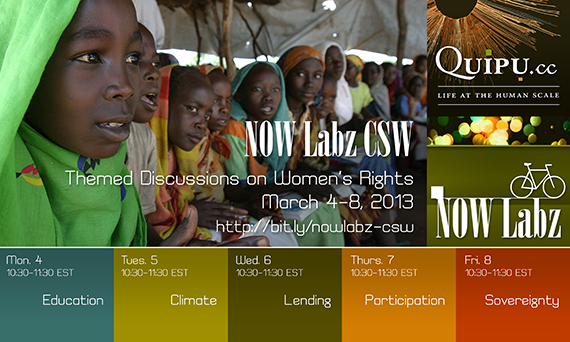 Quipu.cc will be hosting a NOW Labz series of cyberdialogues, timed to coincide with the Commission on the Status of Women, to discuss women’s rights, gender rights, childhood equality and how to build a more genuinely democratic, more resilient global future. The sessions will be held at 10:30, through 11:30 am EST.